See which credit cards are suitable for people with bad or poor credit history. Credit card providers who won't automatically reject you because of past financial difficulties. The web server used by Creditcards4badcredit.co.uk is located in Great Britain and run by UK2 - Ltd. The website Creditcards4badcredit.co.uk has a own web server. The web server only runs this website. 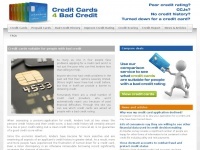 The websites of Creditcards4badcredit.co.uk are served by a Apache server. The HTML pages were created with the latest standard HTML 5. The website does not specify details about the inclusion of its content in search engines. For this reason the content will be included by search engines. The homepage of the website is "/cgi-sys/suspendedpage.cgi".